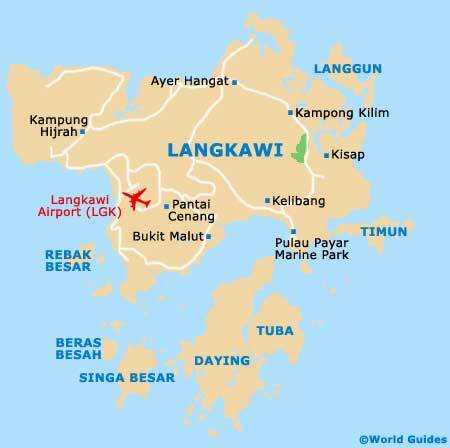 Langkawi has an international airport, with flights from the likes of Singapore and Kuala Lumpur, although most are domestic. Ferry services also come in from the mainland and from nearby southern Thailand. On the island of Pulau Langkawi itself, public transportation and travel is a little thin on the ground, with a meagre bus service. The only real transport option available to holiday makers is to travel by taxi, your hotel shuttle, or to rent a car or motorcycle for the duration of your stay. Langkawi International Airport is the main gateway to the Langkawi group of islands. This busy facility serves more than one million passengers a year from Kuala Lumpur, Penang, Singapore, Phuket, and other regional cities. Popular carriers serving the airport include Malaysia Airlines, AirAsia, and Tiger Airways. The airport is located approximately 20 km / 12 miles from the main town of Kuah and is close to Pantai Cenang. Taxis are readily available and the airport and travel to popular destinations such as Kuah, Pantai Cenang, Pantai Kok, Tanjung Rhu and Teluk Datai. If you really want to see the island, it is best to rent a car, or at the least a scooter. Public transport isn't the best and there is an awful lot to see. Stick to renting from the airport online for maximum efficiency and avoid touts at all costs. Alternatively, some reliable travel agencies offer car rental at the Kuah jetty (do try your hand at bargaining), while the upscale beach resorts also provide the opportunity to hire cars and jeeps, at a price. The roads aren't too bad and traffic is light when away from the town. A bus service does a loop around the island from Kuah and also takes in the main beach resorts direct, although services are infrequent and not to be relied upon. Often far more convenient, the majority of the established resorts have their own shuttles, with daily runs to the town and the most popular beaches. Getting around by taxi is the best bet and taxis are not as overpriced as, say, in neighbouring Thailand. It can be a bit pricey (relatively) from the airport to the main beach at Pantai Cenang, considering the short distance. Taxis wait at all main beaches, in Kuah town, at the Fair Mall and at the ferry Jetty. The Langkawi Ferry comes in from several mainland destinations, including Penang's Georgetown (two hours and 30 minutes), Kuala Kedah (one hour and 30 minutes) and Kuala Perlis (one hour), as well as Satun in Thailand. These are all fast ferries and operate on a frequent basis. There is also a standard ferry from Ko Lipe at Pattaya Beach.